How to Call UAE from the U.S. If you want to call United Arab Emirates but aren’t totally sure what the fastest way to do so is, then you should give our “How to Call UAE” guide here a good look. It will walk you through everything you need to know about calling UAE as well as the general rules regarding international dialing. First dial 011, the U.S. exit code. Next dial 971, the UAE country code. Then dial the 1-digit area code (see sample calling code list below), followed by the 7-digit phone number. Learn how to call the United Arab Emirates from the U.S. Need more help with how to call UAE? Are your international calls totally blocked? Without ever being informed, the cell phone you purchased may have come equipped with its own factory default settings, which most of the time means international calling is blocked until that setting is manually changed or the cell phone company overrides that status for you. Luckily that’s fixed easily enough. Change the setting or ask your provider to do so for you. Because many international calling destinations have a dedicated or assigned beginner digit for all calls made to that nation, you can leave off the area code. Does the cell number you’re dialing begin with a “0”? That’s called a “trunk code,” and it’s only to be used for calls within a few certain countries. You may have mastered the intricacies of how to call UAE from USA, but you still need a way to make those calls, preferably one that doesn’t leave you donating blood just to pay off your phone bill. Welcome to that way…Vonage. Call to United Arab Emirates or have them call you! With our Vonage World® plan, you can call to UAE to both landlines and cell phones at Vonage’s super low per-minute rates. And it’s all made possible by the Vonage Box™, our state-of-the-art VoIP box that will piggyback your phone calls through your high-speed web connection. The box itself costs nothing, nor does activation. Residents of the U.S. also pay nothing for delivery! So get on the horn and call that old flame in Fujairah, or you can get them their own Vonage account. When you do, you’ll get another Vonage Box* in the mail, which you then ship off to UAE, and whoever gets that box will be given a number with a U.S. area code, YOUR area code! Now they can reach out to you or anyone else in the States at the same low rates they’d enjoy if making a domestic call. It gets even better, because Vonage takes care of its own. All calls from any Vonage customer to another are entirely free, so when calling United Arab Emirates to the person that you’ve sent a Vonage Box to, you pay nothing. That’s a lot of zeros, but the good kind. Give those calling cards to UAE a break and retire them for good. Clue me in on a great international calling app, please! Sure thing. 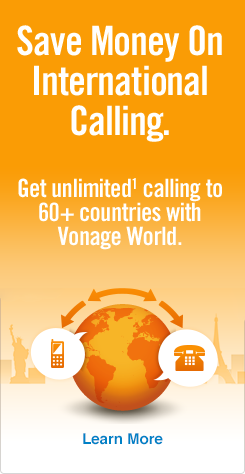 You need to check out Vonage Mobile®, an iPhone® and Android™ calling app built for making free international calls that’s making big waves in a small period of time. It’s free to download and use (you just have to make sure you’re calling another app user, is all), so click on the link to find out more and get calling for free. *You sign up for an additional account and remain responsible for all charges and activity on each account, as well as shipping for the adapter and for compliance with the laws of the country outside of the U.S. where the Vonage adapter may be used. Vonage customer support is in English and Spanish only. Vonage 911 service does not operate outside the U.S.
¹Unlimited Calling and other services for all residential plans are based on normal residential, personal, non-commercial use. A combination of factors is used to determine abnormal use, including but not limited to: the number of unique numbers called, calls forwarded, minutes used and other factors. Subject to our Reasonable Use Policy and Terms of Service. HIGH SPEED INTERNET REQUIRED. VALID FOR NEW ACCOUNTS ONLY. RATES EXCLUDE INTERNET SERVICE, SURCHARGES, FEES AND TAXES. If you subscribe to plans with monthly minutes allotments (for example, U.S. & Canada 400), all call minutes placed from both your home and registered Extensions® phones will count toward your monthly minutes allotment. Extensions® calls made from mobiles use airtime and may incur surcharges, depending on your mobile plan. Where available. The number transfer process takes approximately 10 business days from the time you confirm your transfer request. Alarms, TTY and other systems may not be compatible. Vonage 911 service operates differently than traditional 911. See www.vonage.com/911 for details.